I am posting this video for sausage gravy breakfast lasagna not because it looks great. I’m still not convinced. But I’m posting it because there are some great lessons for learning how to cook yourself thin. First, watch the video and see if you can find the lessons. And you can find the full recipe at the Food Network. Where do you think I would start? Right! They didn’t drain the sausage. There’s a huge amount of grease in there because of the sausage. So first off, drain the sausage. Yes, to make a good gravy, you’ll want some of that sausage fat to mix with the flour in order to make a good roux. But there are some better ways to manage that. I’d consider draining it into a container and then measure out what you need. 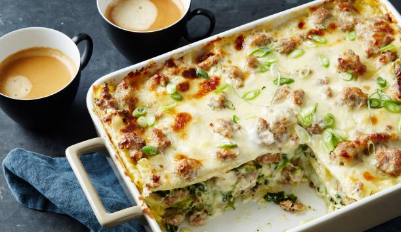 And since this is a sausage gravy breakfast lasagna, you definitely want great gravy. I would probably use two layers of the lasagna noodles….the bottom and the middle layer…and then add in two layers of zucchini cut into thin flat noodles. You could do a blend of spinach and kale if you like kale. I don’t have to mention I don’t care for kale. Although, I’m learning to appreciate it a bit more after having it in some soup. And I’d also add in some mushrooms since I love them. It gives a lovely texture and flavor. You could easily make this lasagna with tofu or turkey sausage. If you use tofu, use something like a soy chorizo to give it more of a breakfast flavor. I’d also add in some scrambled eggs to make it feel more like breakfast. What do you think? Would you like the sausage gravy breakfast lasagna?